Fooditka: Goodbye Lucky Mojo - We'll Miss You! Goodbye Lucky Mojo - We'll Miss You! 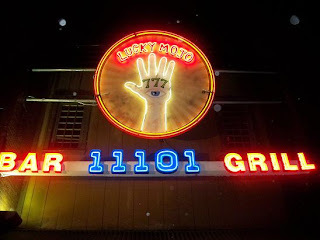 Hearing rumors that Lucky Mojo's, a fun BBQ and sushi place in LIC, was on the outs was finally confirmed today. I know that emotions about this place were mixed--people were either in the love or the hate camp--but I happened to love it and am sad to see it go. Their last day is tomorrow, Saturday, August 29th and they'll be open late "kickin till late Saturday night," they say. For you Mojo lovers, I encourage enjoying one last hurrah with a cold brewski, corn fritters and BBQ ribs. Good-bye Mojo's, it was nice knowing ya! I hope that something else fabulous comes to this spacious saloon-style space, but in the meantime, I'll miss you Mojo's.